MobiCam Multi-Purpose Trouble Shooting | MOBI Technologies Inc. Thank you for your purchase! Having troubles? Below are common trouble shooting tips and tricks. If you're still stuck give us a call at 866-MOBICAM (866-662-4226) or click below. Click any of the topics below for further instruction. MobiCam connects to 2.4Ghz Wi-Fi Networks. It has become common practice for network providers to provide dual band networks for their customers. For example MyWiFiNetwork55-2G and MyWiFiNetwork55-5G. Please ensure that when connecting to MobiCam HDX your phone is connected to the 2G Wi-Fi connection and you are connecting MobiCam HDX to the 2G Wi-Fi connection. MobiCam HDX offers a full HD 1280 x 720 live video stream. We recommend having at least 20mbps download speed. Download speed can also be affected by the distance between your wireless router. Google offers a free tool to check both your download and upload wireless speed. Navigate to Google search from your mobile device, and type in speed test. Click run speed test, your results should display in no more than 30 seconds. Sometimes MobiCam just needs a quick RESET to get things functioning properly. Located on the right hand side, in the center groove that runs down the middle of MobiCam Multi-Purpose Monitoring System is a small hole labeled RESET. You will need a small pin or paperclip to push this RESET button. You will hear a loud BEEP, MobiCam should reintroduce itself and say "Welcome to MobiCam". If MobiCam does not reintroduce itself, please press the RESET button once more, this time unplug MobiCam for 10 seconds before plugging it back in. The LED light on the front of MobiCam may appears as a yellow color, this color indicates that MobiCam is still resetting. Give MobiCam a few moments to complete the RESET process, the light should begin flashing RED and MobiCam should once again reintroduce itself. Sometimes during the download from the app or play store the app can download with a small bug. We recommend uninstalling and reinstalling the app for a quick fix. MobiCam HDX pairs with your phone by sending a sound wave to establish the wireless network connection. This sound wave should be heard loud and clear. Please ensure that your phone is NOT on silent and that your playback volume is turned up. We recommend locating your phone speakers and facing then directly towards MobiCam HDX, so MobiCam HDX can hear the sound wave clearly. When sending the sound wave avoiding having being in a loud area. Click any of the questions below to read the answer. CAN THIS CAMERA BE USED FOR LIVE VIEWING? Yes, MobiCam Multi-Purpose Monitoring System offers a live HD 1280x720 video stream. CAN I RECORD VIDEO AND AUDIO? Yes, the camera provides two recording options for each person with access. Users can record short clips on their phone while viewing the live feed or an external MicroSD card (sold separately), expandable up to 32GB, may be inserted in the camera for continuous recording. HOW MUCH VIDEO CAN BE RECORDED ON A 32GB MICRO SD? 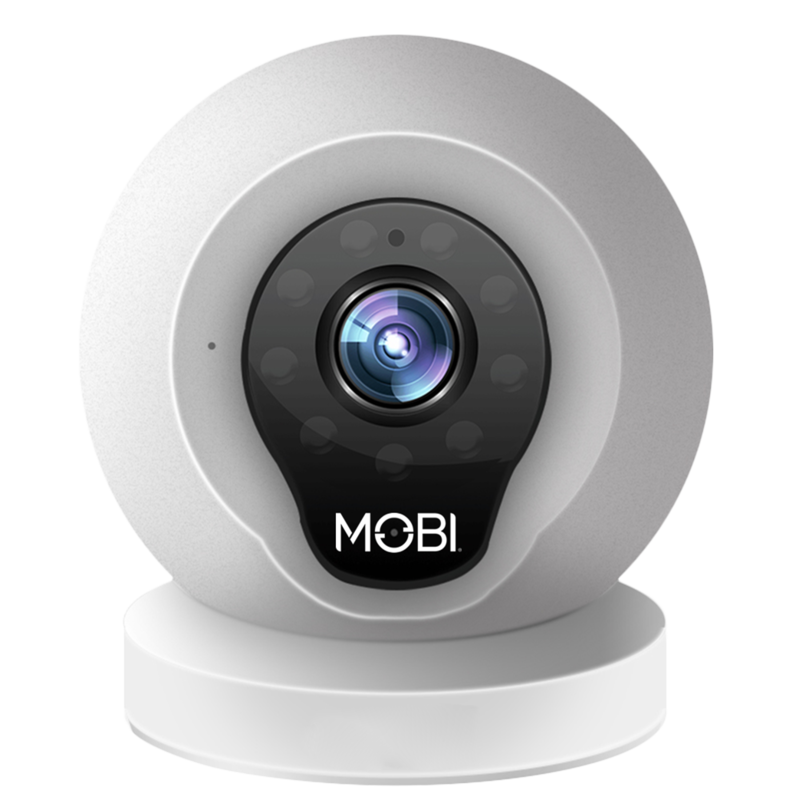 Depending on the selected recording resolution, MobiCam can record up to 20 days. CAN I SHARE MY SNAPSHOTS OR RECORDINGS WITH ANYONE ELSE? Of course! MobiCam has an in app share feature. You may choose between sharing to Twitter or Facebook, or you can share directly through text message or email. Alternatively, if you have given the MobiCam rights to save videos/images directly to your phone, you are free to share your saved videos/image in anyway. CAN I ACCESS MY RECORDINGS FROM ANYWHERE? Yes, your recordings save to the MobiCam App Album or directly to your phone. As long as you have access to your phone and/or MobiCam app. IS THERE A NIGHT VISION IN THIS CAMERA? Yes, MobiCam can see up to 40ft in pure darkness. Night Vision displays in a HD black and white picture. WHAT HAPPENS WHEN THE SD CARD FILLS UP? When the SD card fills up the camera will automatically delete the previous part of the recording to continue recording. CAN I STILL ACCESS/VIEW THE CAMERA FROM OUTSIDE OR AWAY FROM WIFI RANGE? Yes! 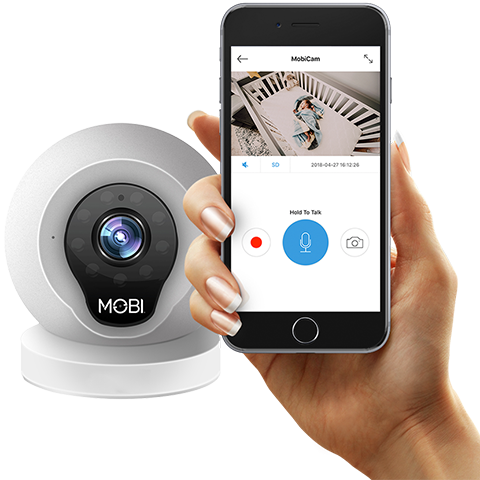 As long as MobiCam itself remains connected to WiFi, you can view MobiCam's live stream from the MobiCam app while you are away from home. Your mobile device must have a data plan or access to a wireless network to view MobiCam. HOW MANY CAMERAS CAN BE CONNECTED IN THE APP? You may connected up to 15 additional MobiCam's to a single account. HOW CAN I FIND THE MOBICAM APP? Your MobiCam instructional manual has a QR code for a quick download for Android and Apple users. Alternatively, you may manually search on the App store or Google Play store for "MobiCam". Be sure to download the correct MobiCam app, with the following icon. SHALL I USE MY EMAIL ADDRESS AS USER ID? Yes, a valid email address is required to sign-up in the MobiCam APP. A verification code will be sent to the provide email to verify the account during the sign-up process. CAN I SAVE MY LOGIN INFORMATION? Yes, your login information is automatically saved. I AM NOT ABLE TO FIND MY WIFI NETWORK IN RANGE? First, ensure your have WiFi enabled on your phone. Double check your WiFi router has power, if you still do not see your WiFi Network being displayed, try resetting your WiFi Router. I DO NOT HEAR THE SOUND WAVE TO CONNECT TO MOBICAM? Ensure that your phone is not set to silent and that your playback volume is turned up. You should hear the sound wave loud and clear. MY CAMERA IS CONNECTED BUT IT STOPS BEFORE IT LOADS, IS MY CAMERA STILL CONNECTED IN THAT CASE? Yes, your camera is still connected to the internet and may just be experiencing a slow connection or some network interference. We recommend navigating back to the IP Camera page and pulling down on the screen to refresh the connection. However, if the LED light on the front of your camera is appearing as anything other than a solid green light, your MobiCam may have disconnected from the internet. You may try unplugging MobiCam for a few seconds and plugging it back in, allowing her to complete boot up before checking the app again. HOW DO I RESET MOBICAM? Located on the right hand side of MobiCam, in the center groove that runs down MobiCam, is a small hole labeled RESET. You will need a small pin or paper clip to push the rest button, you should hear a loud "BEEP" and MobiCam should reintroduce itself "Welcome to MobiCam". DO I HAVE TO BUY A SD CARD SEPARATELY? Purchasing a separate MicroSD card is optional. Inserting a MicroSD will allow continuous recording and the ability to use the playback feature within the MobiCam app. Alternatively, you may record short clips direct to your smart phone within the MobiCam application without a MicroSD card. A MicroSD is not required for MobiCam to function, however, can be very beneficial. Any 32GB brand MicroSD will work. HOW CAN I MOUNT THIS CAMERA IN A BABY'S ROOM? Mobicam's magnetic base allows for multiple mounting options. MobiCam will securely stick to any metal or magnetic surface. You may also mount MobiCam upside down - the image can then be flipped from within the MobiCam app to display the live stream up right. HOW DO I UPGRADE MY MOBICAM SOFTWARE IN THE FUTURE? Registering your MobiCam online on www.getmobi.com/warranty-registration . Any software updates will be sent via email. Registering your product ensure you willa lways have the most up to date information, as well as extend your MobiCam warranty. CAN THE USB CORD BE EXTENDED? Yes, you may extend the USB cord with the purchase of a USB cord extender.